Get ready to break some bones and crush some skulls, Mutant Football League has launched digitally for PlayStation 4 and Xbox One today for $19.99, MFL is the latest digital download offering from Digital Dreams Entertainment LLC. Mutant Football League has already been named as the "Best Sports Game" of 2017 by Shacknews and has been the subject of numerous (fake) cover features. 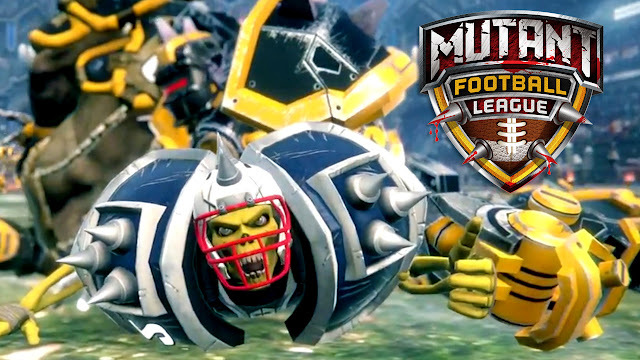 Check out the new Mutant Football League launch trailer now! Called "fast fun and easy for casual fans," as well as "incredibly violent and full of cheesy horror puns" (by the same reviewer! ), Mutant Football League is loaded with blood and guts and humor that would make Dave Chappelle blush. MFL offers deep strategic 7-on 7 gameplay, and a ghoulish roster of skeletal deadheads, monstrous orcs, diabolical bruiser bots, criminal aliens and mutant humans. Legendary voice-over actor Tim Kitzrow (NBA Jam) lends his vocal chops to pepper up the commentary with memorable lines about soft balls, shotgun hits and decapitation protocol, while Brian Schmidt (Crue Ball, Madden 93-96, Jungle Strike) provides sound design and ferocious rock-driven music tracks along with a multitude of Indie bands that perfectly marry the on-field mayhem. "Thanks to our community and a stellar dev team you can now play MFL on console - where it belongs! This game delivers a new experience of fun, arcade style football action for a new generation of gamers, while retaining the spirit of the original game," said Michael Mendheim, Creative Director. The classic Mutant League Football game, released in 1993 by Electronic Arts for the Sega Genesis, was a #1 bestseller and garnered a loyal cult following for its blend of monsters, mayhem, and good ol' American-style team sports. Support from diehard fans resulted in a successful 2017 Kickstarter campaign to raise funds to complete MFL's development. The campaign reached its pledge goal in a mere four days, fortuitously achieving its funding aims on Super Bowl Sunday. Boom-Shacka-What? : Legendary voice-over actor Tim Kitzrow--best known for being the voice behind NBA Jam--provides the game's 'colorful' commentary. Down 'n' Dirty: Use dirty tricks during gameplay to "Bribe the Ref," throw bombs, or equip weapons to inflict maximum carnage for real game-changing moments!